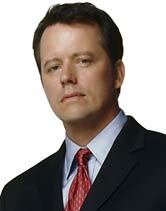 Even before his critically-acclaimed performance as Robert F. Kennedy in the film "Thirteen Days" brought him to the attention of moviegoers, Steven Culp had already attracted a large following among television fans for his recurring role as the mysterious CIA agent Clayton Webb on the series "JAG." Last season he achieved what may have been a TV first by appearing in major recurring roles on four different series at the same time – as Webb on "JAG," as House Speaker Jeff Haffley on "The West Wing," as Dr. Corday's love interest, Dave Spencer, on "ER," and as the stalwart Major Hayes on "Star Trek: Enterprise." He also guest starred on "CSI" and "Lyon's Den." Somehow, in the midst of this schedule, he managed to take on a leading role in the upcoming feature "The Sisters," starring Maria Bello, Mary Stuart Masterson and Erica Christensen. Culp's other feature films include "The Emperor's Club," "Spartan," "Nurse Betty," "James and the Giant Peach," "Fearless" and "Dead Again." He made his primetime TV debut as John Hay in the Emmy-winning miniseries, "Gore Vidal's Lincoln," opposite Sam Waterston and Mary Tyler Moore. Since then he has appeared in numerous episodic television shows and TV movies, among them recurring roles on "24," "Ally McBeal" and "Philly"; guest-starring appearances on "The Practice," "Crossing Jordan," "Providence," "Boston Public" and "Chicago Hope"; and roles in the movie-of-the-week, "A Story to Die for," with Angela Lansbury, "How to Make a Monster" for Cinemax's "Creature Features," produced by Stan Winston, and the television movie "Norma Jean and Marilyn." Beginning his career in New York, Culp has worked with some of the best playwrights and directors in the American theater. He appeared in the premieres of Tony Kushner's "Slavs" (Actor's Theatre of Louisville), Terrence McNally's "The Lisbon Traviata" (Theatre Off-Park), A.R. Gurney, Jr.'s "Sweet Sue" (Williamstown Theatre Festival), Neil Simon's "Actors and Actresses" (Hartman Theatre), Keith Reddin's "Highest Standard of Living" (Playwright's Horizons) and Jonathan Tollins' "If Memory Serves" (Pasadena Playhouse). He received Drama-Logue Awards for his performances in "Angels in America" at the American Conservatory Theatre in San Francisco and in the West Coast premiere of Nicky Silver's "Raised in Captivity" at South Coast Rep. He starred opposite Annette Bening in "Coastal Disturbances" on Broadway, and appeared with Kevin Kline in "Richard III" in Central Park. Culp was most recently seen on stage in "ART" at the South Coast Rep.